Most critics didn’t like Ride Along 2 as much as the 2014 original, which they also didn’t like. Then again, most critics don’t watch the films with their families, approaching each one as a night of entertainment. And my family (two adults and two teens) thought Ride Along 2, starring Ice Cube and Kevin Hart, was plenty entertaining. This sequel follows the buddy cop action-comedy formula with a few nods to previous films in the genre. As with Lethal Weapon 2, Ride Along 2 tosses a non-cop third party into the mix. Instead of Joe Pesci sitting in the back seat we get comedian Ken Jeong, who plays a hacker with information about a top crime kingpin (Benjamin Bratt). And like Beverly Hills Cop and Running Scared, Ride Along 2 takes the cops out of their jurisdiction into a more exotic location, where they end up working with local law enforcement officers. In this case, Miami provides the upbeat location and an excuse for some pretty decent soundtrack music, with Olivia Munn starring as Maya, a homicide detective. A year after the events of Ride Along, Ice Cube is still the tough Atlanta undercover detective James Payton who is still tormented by his annoying brother-in-law to be and probationary cop Ben Barber (Hart). James’ sister, Angela, loves Ben but wants him out of her hair for a while to plan the wedding, so she talks her brother into taking Ben along to Miami, where he’s following a lead on a drug case. If you’re keeping score, that makes two main characters who find Ben Barber/Kevin Hart’s non-stop chatter and high-energy enthusiasm at least partly annoying, and I’m guessing that people who don’t like Hart’s schtick will find Ride Along 2 tedious. We found it hilarious. 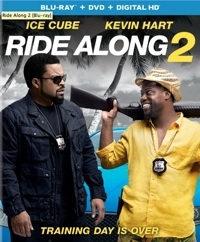 Ride Along 2 offers plenty of laugh-out-loud moments, some fun action scenes (the most memorable of which involves Hart’s character piloting a fork lift and creating havoc in a portside storage container area), and a plot that’s just good enough to support the banter and antics of the two stars. Meanwhile, the kids will like video game scenes and Ben’s encounter with a humongous alligator. There isn’t much in the way of surprises, but the thing about buddy cop pictures is that the chemistry between the two stars is what matters most, and Ice Cube and Kevin Hart are fun to watch. Director Tim Story doesn’t seem to think audiences will wonder why it takes a major false bust of a local respected businessmen (ala The Naked Gun) before two cops out of their jurisdiction are finally restricted, but logic isn’t the focus: action and comedy are. Ride Along 2 is an appealing crime comedy for families with children 13 and over . . . if you don’t mind Kevin Hart and Ken Jeong screaming a lot. These are exciting times for Star Wars fans, who can be forgiven if they start to think of the seventh film in the series as Star Wars: The Franchise Awakens. In effect, Disney has launched Star Wars 3.0, a glorious reboot that’s the first of six films planned for release over the next five years: three stand-alone spin-offs and a trilogy begun by The Force Awakens, according to Business Insider. 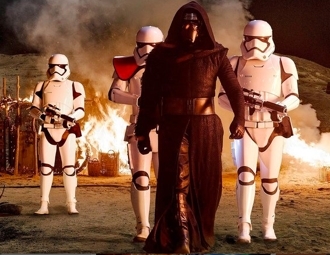 Never mind that Star Wars: The Force Awakens was the highest grossing film of 2015. The exciting part is that with this film, a trio of writers led by Lawrence Kasdan (The Empire Strikes Back, Return of the Jedi, Raiders of the Lost Ark) put the fun and fast-paced serial adventure back into Luke Skywalker’s galaxy, and, just as importantly they give us new characters that we care about. 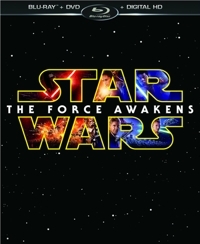 Under the capable direction of J.J. Abrams (Lost), The Force Awakens also combines the best of both worlds. Fans get the slick technical wizardry of Revenge of the Siths and the otherwise ho-hum Phantom Menace and Attack of the Clones, combined with the lighter tone and occasional humor that made A New Hope, The Empire Strikes Back, and Return of the Jedi so much fun. It’s fun, too, seeing Harrison Ford, Mark Hamill, and Carrie Fisher reprise their roles as Han Solo, Luke Skywalker, and Princess Leia—even if, as Hamill joked, he’s onscreen for less time than Finn drinking with a hippo. Some might say it’s just a little too tidy having offspring of those beloved characters turning up as “players” in this new struggle of resistance fighters trying to stop the First Order, as the imperialists are now called, but there are plenty of instances in real life where children of politicians also become main figures on the world stage. Fruit doesn’t far fall from the tree, and that probably goes double for people with Jedi blood. The Force Awakens recycles elements from the main storyline of A New Hope, the film that introduced Star Wars in 1977. The emperor may be long gone, but a new one who speaks via hologram has taken his place. Each film begins with someone on an arid, isolated planet finding a droid that has been given an important piece of information. 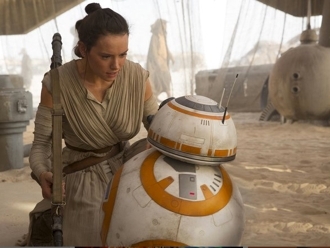 In the case of The Force Awakens, a scavenger named Rey (Daisy Ridley) who is all alone in the world comes across a BB-8 that’s even more endearing than R2-D2. She meets her own version of a bad boy/antihero (a stormtrooper defector named Finn played by John Boyega) and the two of them seem destined to create movie magic together. Four main characters are introduced—six, if you count a diminutive goggle-eyed Yoda substitute voiced by Lupita Nyong’o and that cute new BB-8—and while Oscar Isaac is engaging enough as resistance pilot Poe Dameron, he doesn’t have the same on-screen presence as Ridley and Boyega, or maybe isn’t able to insert enough of his own personality into the role to make him memorable. The costume design took me a bit by surprise, as Disney tried for a Darth Vader update with Adam Driver playing the simpering Kylo Ren wearing a mask that looks a cross between Vader and something Hannibal Lector would wear, and the new stormtrooper helmets flatten out at the bottom so that they look a little like the goalie mask on the old Annaheim Ducks uniforms. But the production design is slick while still appearing realistic and not 100 percent CGI-looking, the way so much of Menace or Clones did. That’s just how far CGI special effects have come. What makes Star Wars: The Force Awakens a winner is that those state-of-the-art CGI effects accompany a return to old-fashioned storytelling and the lighthearted tone of the serial-inspired original films. That combination guarantees The Force Awakens will get plenty of repeat play. It’s a great popcorn movie that announces this series is back on track again. And does it look phenomenal in Blu-ray! A disc of bonus features is included, and while the deleted scenes aren’t as tantalizing as fans might expect, a full-length documentary is satisfying and there are plenty of excellent shorter features as well. Shop around if you want to add this title. Best Buy, Target, and Walmart all have exclusive releases. This is the general release, available through Amazon and other outlets. Language: Two “hells” and one “damn” is pretty tame. Violence: This film’s PG-13 rating comes solely because of sci-fi violence. Lots of blasters, lots of explosions, and lots of characters being killed . . . or in the case of an opening sequence, murdered. An attack by multiple-tentacle creatures can be pretty intense for younger children, but the film’s most haunting moment of violence comes when a stormtrooper is shot and as he dies he leaves his bloody handprint on another trooper. It’s so we can identify which trooper to watch, but still…. Adult situations: Some background characters smoke and drink in the cantina, but nothing more. Takeaways: The Force is back . . . in force! And with new characters, Disney and LucasFilm are well positioned to finish this new trilogy as impressively as they began it. Steve Martino is a brave man. Sure, he directed the Dr, Seuss classic Horton Hears a Who! (2008) and Ice Age: Continental Drift (2012), the fourth installment in the Fox animated prehistoric series. But Charles Schulz is in a totally different league. One of the most famous cartoonists of all time, Schulz received the Congressional Gold Medal for his influence on America culture—an influence that famously extended into the U.S. space program, with the Apollo 10 command module named “Charlie Brown” and the lunar module named “Snoopy.” Over his career Schulz drew close to 18,000 Peanuts comic strips, published dozens of collected strips in books, and came into American homes through a series of now-iconic television specials, many of which were linked to holidays. And that’s just the tip of the iceberg. 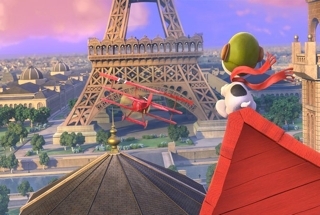 Upon his death, Schulz requested that his characters remain essentially unchanged, and The Peanuts Movie was to be the first time the characters were rendered in 3D CGI. In addition, the script was written by Cornelius Uliano and Schulz’s son and grandson, who also had a hand in producing the film. But hey, no pressure! Martino presides over a production that remains faithful to the spirit of the Peanuts world, choosing to surprise viewers not with twists or deviations, but with the clever rendering of familiar elements from the Peanuts gang repertoire and recognizable visual cues from the comics themselves. 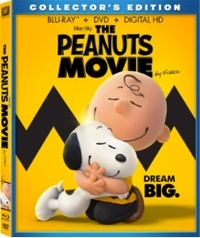 Snoopy hauls out his typewriter and takes to the skies atop his doghouse to fight the Red Baron, Charlie Brown is smitten by a new red-haired girl in the neighborhood, and everyone starts to think differently about failure-magnet, disaster-prone Charlie after he scores a perfect 100 on an exam. In the end, the perceived messages about never giving up, the thin line that often separates failure from success, and the fickleness of public opinion come across loud and clear—whether you’re an adult or a child. And universal messages like that are a big part of what has made the Peanuts adventures popular with all ages. If The Peanuts Movie feels like a first, it’s only because it’s the first full-length animated feature to be produced for the big screen in 35 years. It’s the fifth film, really, though this one feels like a first film because it introduces all of the familiar elements for a new audience. Yet, old ones will take delight in the way that those familiar elements are treated. Lucy is her old irascible self, setting up her psychiatric advice booth on the street in the middle of winter—though she could probably stand to see a shrink herself because of her self-image and anger-management issues. Pigpen doesn’t have much to do, but his cloud of dirt appears every now and then. Schroeder is more visible with his Beethoven fetish and his toy piano, and Charlie’s sister Sally seems to lurk everywhere in the wings, like a real little sister. 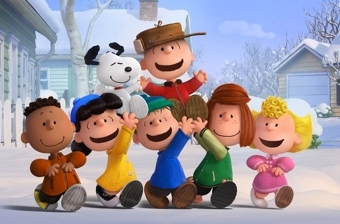 Despite being set in winter, The Peanuts Movie manages to bring in all of the most famous “bits,” from Charlie Brown’s disastrous attempts at kite-flying to school talent shows, or from birdie Woodstock and Snoopy’s comic antics to and Charlie Brown’s dance lessons. The 3D CGI characters and stylized backgrounds seem perfectly melded by comic-strip wordless graphics like gigantic stars briefly flashed to signify an explosion or implosion, thought balloons, or eyes and eyebrows on a character that shift like drawings hovering over the CGI bodies. The effect is fairly mesmerizing and adds a charming uniqueness to the faithful tone and treatment of familiar material. The Peanuts Movie is one of the better 3D CGI animated adaptations in a sub-genre that sees far too many wrong turns and stinkers.